New items on the website. Direct link to Scandinavian website price lists. Direct links to U.S. and World stamp website price lists. How to obtain printed price lists by postal mail or download price lists as PDF files. Finland Stamps: I have just added some early specialized items and color varieties. Iceland U.S. WWII Military Covers: Today I have added a nice cover to the APO 810 (Baldurshagi, Iceland) page. Norway Test Stamp: The composer Grieg 1943 postage stamp design was used in 1951 to make a test stamp. Norwegian Madagaskar (Madagascar) Missionaries Local Post Stamps: The originals of these exotic stamps are quite rare and sell for hundreds of dollars each. However, in 1968 a Norwegian philatelist printed (only) 200 examples of a numbered, reproduction souvenir sheet containing 16 stamps. Even the souvenir sheet is rarely offered. Norway Essay: A beautiful essay (unadopted design proposal) design was created, in black and red, for the composer Grieg 1943 stamp issue. (This is not to be confused with the later test stamp that borrowed from the design of the issued Norwegian stamp design.) It is a very scarce essay, but I have been lucky to find a couple more examples. Norway Ship Covers: I have just added a nice group Norwegian ship covers. For being a seafaring country, it can be hard to find Norwegian ship cancellations on cover! Norway Covers with Supplementary Markings: I have just added a page for covers bearing postally-related markings that are other than cancellations, etc. While postage due, registry, ship markings, and other categories have their own pages, other markings will appear here. Sweden Stamps: Sweden's 20 öre Oscar stamp, with watermark (Scott #60), was in use for 20 years (1891-1911) and is a very common stamp. However, most collectors are not aware that there are two engraving types of this stamp (only on this stamp, not on any of the other denominations). The first type was issued 27 March 1891; it was replaced by the second type sometime in November 1891 after little more than seven months of use. While the first type is not "rare", it is hard to find and especially with nice centering and/or with nice postmarks. The stamp was first issued in Ultramarine color, with the blue shades coming some years later. Though the Facit catalog only formally lists five colors/shades, there is actually a wide range of color shades. One of the listed colors is a Slate [Grayish] Blue that is surprisingly scarce, in the true Slate color, considering the very low catalog value. I have just added several interesting examples of these items. Sweden Ship Covers: From the 1920s onward, some larger Swedish-flag ocean-going passenger ships had formal Swedish post offices on board, resulting in a wide range of collectible postmarks and postal history. And domestic Swedish steamship mail cancellations were in use from 1869 through 1951. This is a fascinating and challenging collecting area. Palau "Huge" Stamp: This souvenir sheet contains one of the world's largest postage stamps. A significant group of new Collection Lots, Albums, and Literature have been added. An emailed-only 11 April 2019 E-News has been issued. If you do not receive the E-News, Subscribe now! Denmark Stamps: Just added are a very inexpensive example of the rare Scott #21 and a very pretty #141. The former is the rarest regular stamp issue of Denmark and the latter is an extremely lightly hinged example of a scarce stamp that is quite hard to find in nice quality. Norway Stamps & Covers: I have just added some interesting early stamps and unusual blocks, some interesting covers, and even a very unusual Amundsen-related charity label that is seldom offered. Also a great King Haakon picture post card and a nice souvenir card. United States Covers: I have just added covers bearing examples of #1 and #2, our first postage stamps issued by the national government. Great Britain Penny Black Cover: Very attractive stamp with four large margins, fully tied by a neat and light red cancellation, and with a clear town postmark. You can own the world's first stamp on cover! People's Republic of China Stamps: A nice group of very scarce 1967-1968 stamps have just been added (two-thirds down this page). All are illustrated. These are in great quality. As is the case many times for the scarce PRC stamps of this time period, these were originally sold behind the Iron Curtain and later made their way to the West. These examples are from a collection originally formed in Poland; after Poland opened to the West, the collector emigrated to the U.S. and brought his stamps. Stock Pages: More sizes have been added. An emailed-only 4 April 2019 E-News has been issued. If you do not receive the E-News, Subscribe now! Faroe Stamps: I have just added some nice examples from Scott #2-6, issued during the British occupation of the Faroe Islands, with nice town and village cancellations. Finland Booklet Panes: The Finnish vending machine (i.e. slot machine) booklets issued 1959-1993 typically contain panes with different stamps and includes some stamps that were only issued in these booklets. Spaces for the panes are included in many stamp albums. Even though most are quite inexpensive, they can be difficult to find. I have restocked this area and also have just added the scarcer Scott #398b and 402b in complete booklet, Facit #Ha3V. Hawaii Stamps: Though I fairly recently added to the website a group of Hawaiian stamps, several recently purchased collections have resulted in adding several dozen more very nice stamps, including revenues and postmarks. Stock Pages: New this week are web pages for various types of stock pages. These include the traditional manila pages, as well as both new and gently used black plastic pages (such as Lighthouse Vario, Lidner, and Safe) and black paper pages (such as Hagner). The vast majority of these pages are American 3-ring size that will fit in any standard binder. Whether putting your collection in such pages (as I do when I am in the organizational phase) or using for sorting & storing duplicates or stamps to be identified, these are extremely useful for any collector. An emailed-only 28 March 2019 E-News has been issued. If you do not receive the E-News, Subscribe now! Iceland Stamps: I have been restocking Scott #86-91 stamps both in "normal" NH, Mint Hinged, and Used; and varieties. Worldwide Stamps: This week I have added stamps for several British North Amercia countries: Allenstein, Bangladesh, Barbuda, Basutoland, Austrian Offices Abroad, and Austria: Lombardy-Venetia. Stamp Mounts: I have just added several lots of opened packages of various sizes of stamp mounts, as well as dozens of sealed packages in a wide range of sizes; this is new-old stock. I have also added two pages; now there are a total of four pages: Split-back style (i.e. Showgard) in black & clear, and open-3-sides style (i.e. Hawid) in black & clear. An emailed-only 21 March 2019 E-News has been issued. If you do not receive the E-News, Subscribe now! United States Stamps: This week I have just added dozens of U.S. stamps starting from Scott #120 through the Columbians (all the way to the $5) and the Trans-Mississippi issue (including the $1 Cattle in Storm). An emailed-only 14 March 2019 E-News has been issued. If you do not receive the E-News, Subscribe now! DWI Stamps: I have just added a very nice NH example of the Second Printing of the 5 cent Bicolor Perf 14 x 13.5, Scott Classic/Specialized #8a (Thin Paper), Facit #8b, AFA #10.2. The early printings are quite scarce in NH condition. Denmark Stamps: This week I have added very low-priced examples of Scott #1a Used and #11b Mint, both with Lasse Nielsen opinions. I have also been working on adding Specialized Stamps and restocking the "normal" stamp listings for the Christian IX (Scott #65-71) and Frederik VIII (Scott #72-78). United States Stamps: I have just added several dozen U.S. Classics, starting with #1 and running to #119. An emailed-only 7 March 2019 E-News has been issued. If you do not receive the E-News, Subscribe now! Puerto Rico (U.S. Administration) Stamps: This week I have added a nice group of U.S. stamps overprinted for use in Puerto Rico. An emailed-only 28 February 2019 E-News has been issued. If you do not receive the E-News, Subscribe now! Denmark Covers: Ranging from a 1799 pre-stamp cover to 1850s-1870s stamped covers (including a 3-color franking), to an early stamped (scarce color) official mail cover, I have just added a nice group of early covers. Faroe Covers: I have just added a nice range of Faroe covers, from most eras, including WWII-ERA USE OF THE FAROE "V.L." PERFIN ON A VERY INTERESTING COVER. There is also a very nice FRANCO BETALT item, along with a range of covers from pre-WWII through the middle years and to ship covers (including to/from Iceland) from the Faroe-stamp era. Worldwide Stamps: This week I have added stamps for several British North Amercia countries: British Columbia, New Brunswick, and Prince Edward Island. An emailed-only 21 February 2019 E-News has been issued. If you do not receive the E-News, Subscribe now! Early Faroe Stamps: I have just added a nice range of the early overprints, including #1 single and on cover, as well as the WWII-era issues (Scott #2-6) in NH, Mint Hinged, and Used. Faroe Covers: I have also added some nice pre-WWII and WWII-era covers, including a very unusual totally complete (with coupon and both halves all still connected) early COD card. Worldwide Stamps: This week I have added stamps for several worldwide countries: Bahamas, Bahrain, and Barbados. An emailed-only 14 February 2019 E-News has been issued. If you do not receive the E-News, Subscribe now! Aland Pre-Stamp Covers: In 1817, Sweden controlled what we now call Åland. Here is a beautifully preserved official mail (with the Swedish Three Crowns marking) military report between two tiny military outposts in Åland. Worldwide Stamps: This week I have added stamps for several new worldwide countries: Anguilla, Anjouan, and Aruba. An emailed-only 7 February 2019 E-News has been issued. If you do not receive the E-News, Subscribe now! Denmark Stamps: Denmark's skilling-value Official stamps can be quite hard to find in nice quality. I have just added a beautiful example of #O3, with certificate. Norway Covers: I have just added an interesting range of Norwegian covers, ranging from 1849 pre-stamp to Crown & Posthorn cancellation to airmail rates to military mustering postal stationery cards to machine cancellations to early skiing and ski jumping competition picture post cards to a scarce Christian Youth postmark to the 1943 "London" issue and the 1947 Post Office 300th anniversary issue, and a Svalbard / Spitzbergen canceled cover. Sweden Stamps: It's been a long time since 1858 -- 161 years in fact -- but I was fortunate to obtain four mint, two of which are never hinged, wonderfully fresh examples of the Swedish 1858 "Vapen" issue. Two of them have "HOW" (Helena Obermuller Wilen) certificates, the best there is. It is rare to be able to offer mint examples of these stamps in such nice quality. Additionally, I have added wonderful NH examples of all three values of the 1921 Gustav Vasa set; this issue usually has poor centering, but these three stamps are exceptionally nice. Worldwide Stamps: This week I have added stamps to several Australian States: Queensland, South Australia, Tasmania, Victoria, and Western Australia. An emailed-only 31 January 2019 E-News has been issued. If you do not receive the E-News, Subscribe now! Danish West Indies Christmas Seals: After I mentioned these a couple weeks ago, I had good response and sold out of 1909 & 1910. I have now been able to restock those two years in both NH and Mint Hinged. With those, I now have examples of ALL the DWI seals complete from 1907 through 1916 in NH (and also most in Mint Hinged). Denmark Stamps: I have been restocking again, this time focusing on the 1930s-1940s, including tête-bêche pairs. Finland Stamps: I have also been restocking in Finland, especially 1890-1929. United States Stamps: Today I have a great group of U.S. stamps, from the 1890s through 1935. They include Columbians, early Bureau issues, Washington-Franklin issues, a Nebraska overprint used from Puerto Rico (!! ), and some interesting Farley imperforate items. Canada Stamps: I have been working on classic Canadian stamps and have added some very nice items ranging from 1859 though 1893. If you collect Canada, these definitely are worth a look. In the process, I have created a "Canada New Arrivals - Stamps" page so you can easily see the latest additions. An emailed-only 24 January 2019 E-News has been issued. If you do not receive the E-News, Subscribe now! Danish West Indies Stamps: Today I have added some very scarce DWI Postage Due stamps, #J8a, J8b (only 100 exist! ), and also #J8 with the rare Customs House cancellation (now listed in the Scott U.S. Specialized in the DWI Revenues section). Denmark Stamps: I have just added a couple nice early items, which can be seen here, along with a lot of other nice items. Iceland Stamps: I have also added some nice early varieties, which are found here, along with a great range of other recent additions. United States Stamps: Yesterday I added a very nice range of early U.S. stamps, from the imperforate classics, up into the Columbians, both mint and used. Angola Stamps: This country, previously a Portuguese colony, has always been popular. I have just added a nice range of attractive stamps. An emailed-only 17 January 2019 E-News has been issued. If you do not receive the E-News, Subscribe now! Danish West Indies Christmas Seals: The first Christmas Seal issued for DWI was in 1907; the first in the world was 1904 for Denmark. The handsome DWI 1907 seal is quite scarce and is one of the scarcest national seals of all the Scandinavian countries. I have just listed two very attractive examples of the DWI 1907 seal. Danish West Indies Protest Label: A couple weeks ago I offered a nice example of one of the labels protesting the sale of DWI to the U.S. Today I can include an excellent example of the other, scarcer primary design. Slesvig Stamps: Scandinavian collectors of Denmark tend to think of Slesvig as a small group of stamps at the back of their Danish album. However, for collectors of German philately, Slesvig is an important post-WWI subject. Following WWI, the Slesvig/Schleswig Danish-German border area was divided and subject to a plebiscite; the northern area became Danish and the southern area became German. I have just added two very nice & unusual imperforate sets of stamps that deserve to be seen. An emailed-only 3 January 2019 E-News has been issued. If you do not receive the E-News, Subscribe now! Faroe Stamps: I have recently restocked some items that had been out for a while. Check to see if there are any you need. Also, if you collect "natural world" or ocean-related topics, Faroe has a great many stamps to offer. Finland 1960s-1970s Definitive Stamps: I have just restocked the various plate types, papers (different types of fluorescence), perforations, etc. Take a look to see if there are stamps you need. United States Stamps: I have just today added a very nice range of 50 U.S. stamps from #9 through #291, both mint and used. An emailed-only 27 December 2018 E-News has been issued. If you do not receive the E-News, Subscribe now! Aland Covers: A group of 1984 covers bearing Frama machine stamps (the first design of their Frama machine stamps), from wide range of small towns and villages, and with variety of postal rates and services. Included are some with combinations of Åland and Finnish stamps! Norway Stamps: I have just added a Norway Scott #180, used in the proper time period, with a very nice (and genuine) well-centered postmark. This stamp is quite scarce thus. Sweden Postal Stationery: I have just added an unusual postal stationery letter card. This is not a costly item, but it can be hard to find and the stated issue quantity of about 10,000 is really divided up between two different overprint colors and at least three different inside imprints. These seem to have been made (overprinted) especially for banks, either to consume the banks' own excess stock or to consume excess stock the post office had on hand after postal rate changes. Because these letter cards did not have general circulation they are not often seen. An emailed-only 20 December 2018 E-News has been issued. If you do not receive the E-News, Subscribe now! Denmark Stamps: I have today added a wide range of items, from an unusually nice example of Denmark's first stamp (hint: it is not Scott #1; do you know what it is?) to a very nice selection of dozens of gallery, bargain, and specialized items. D.W.I. Political Protest Labels: I have just added a wonderful example of one of the DWI political protest labels. Examples of all three types are available. Iceland Stamps: I have added a few interesting Icelandic items. Norway Stamps: I have also added a few interesting Norwegian items. U.S. Vending Perforations on Cover: I find these vending machine perforations to be fascinating. In the early 1900s, large mailers were experimenting with postage affixing machines, as well as other experiments with postage vending machines. The stamps for these uses were supplied by the post office, during 1906-1927, in imperforate sheets of 400, to a few companies who then turned them into coils with various types of vending perforations. The Scott U.S. Specialized Catalogue has an excellent special section devoted to them. Finding examples on covers is challenging. I have just added a few nice covers that have surprisingly modest prices. An emailed-only 13 December 2018 E-News has been issued. If you do not receive the E-News, Subscribe now! Great Britain "Penny Red": Complete Plating of 240 stamps from plate #98. Not only is this a somewhat scarce plate number, but this plating consists of all 240 positions from that specific plate. Assembling this probably took decades and probably required examining hundreds of thousands of stamps. U.S. Possessions Stamps: Today I have added a range of stamps from the U.S. Administration of Cuba, Guam, and Philippines. Worldwide Stamps: This week I have added stamps to New South Wales. An emailed-only 6 December 2018 E-News has been issued. If you do not receive the E-News, Subscribe now! 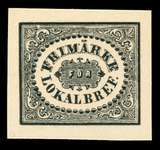 Denmark Stamps: Some early issues, some attractive and scarce blocks at very low prices, plate varieties, tête-bêche pairs (including TB 42, two NH Superb examples of one of the rarest of the gutter-TB pairs). WWII-Era Danish Legion Stamps: Little known to most collectors of Denmark is that during WWII, under German occupation, stamps were issued in support of Danish Legion soldiers who were at the Eastern Front, fighting on behalf of the Germans. These stamps are quite scarce (or rare). I have one issue, Mint with certificate, and another set that is also genuine stamps, but to which fake cancellations have been added (and thus at a very low price). D.W.I. Covers: A very nice group of covers has just been added. They range from pre-stamp to stampless to stamped with British postage (very inexpensive), and then with DWI stamps. The DWI-stamped items include a rare INVERTED FRAME BISECT COVER and a rare "business papers" postage rate cover. There are also a variety of U.S. Virgin Island covers which are always quite popular. Iceland Orlof Overprinted Stamps: Issued to make mandatory payroll savings for vacations, Iceland first overprinted postage stamps. They later issued special-purpose stamps (also available, but only on approval at the moment). Some nice new overprinted postage stamps have just been added. Sweden Stamps: I have just added some interesting early mint stamps, used plate varieties, nice cancellations, etc. An emailed-only 29 November 2018 E-News has been issued. If you do not receive the E-News, Subscribe now! Finland Stamps: I have been restocking a wide range of Finnish stamps, from early issues to modern, from NH to Mint Hinged to Used. Iceland Stamps: I have also been restocking Icelandic stamps, from early issues to modern, from NH to Mint Hinged to Used. Norway Stamps: I have just added a very nice Scot #67 (there are now two to choose from). U.S. Stamps: Early sheets and extremely fine centered 1930s issues have been added. Worldwide Stamps: This week I have added stamps to Afars & Issas, Afghanistan, Aitutaki, Albania, Alexandretta, Algeria, and Antigua. An emailed-only 15 November 2018 E-News has been issued. If you do not receive the E-News, Subscribe now! Denmark Stamps: I have been restocking a wide range of Danish stamps, from early issues to modern, from NH to Mint Hinged to Used. Norway Stamps: I have also recently added some very nice one-of-a-kind Norwegian stamps. U.S. Postage Due Stamps: Back in the day, large companies paid for their business reply mail with full sheets of postage due stamps. I have added some very inexpensive and fun examples of full sheets. U.S. Maximum Cards: For some reason, there are not very many U.S. maximum cards compared to lots of other countries. Colorano (an FDC maker) prepared some maximum cards back in the 1960s-1970s that are very seldom offered. I have just a few from 1966-1973. U.S. Dollar Value First Day Covers: Linn's columnist Chad Snee has a very interesting column called Dollar Signs; it is about U.S. dollar-value stamp issues and their uses. It has always caught my interest, but since I can't collect what I sell, I like to put fun items on the website. Today I have added a group of nice dollar value first day covers. An emailed-only 8 November 2018 E-News has been issued. If you do not receive the E-News, Subscribe now! Aland Covers: I have just added a nice group of Åland covers ranging from 1891 to 1951. Faroe Cancellations: A nice group ranging from the 1920s to the 1960s has just been added. Finland Animal Welfare Charity Seals: I do not know when the world's earliest animal welfare charity seal was issued, but Finland's 1906 issue has to be one of the earlier ones; though I am not a student of the animal welfare subject, I don't know of any earlier seals. I have just added examples of both of the 1906 seals. In addition to being early and scarce, these 1906 seals have a wonderful design. U.S. Duck Stamps - Lower Brule Sious Tribe: I have just added an attractive group of these tribal stamps. Though they happen to look great, they are not "philatelic" -- they are "real" duck stamps that had a purpose. Heligoland: I have just added a nice grouping of reprints of these classic stamps. Most such reprints of Heligoland are quite old (not modern) and are a fascinating challenge to collect in their own right. An emailed-only 1 November 2018 E-News has been issued. If you do not receive the E-News, Subscribe now! D.W.I. Covers: I have added some very interesting and attractive pre-stamp, stampless, and stamped covers. A variety of nice items have been added to Denmark Stamps and Denmark Covers. Finland Covers: I have just added a wonderful "cork" cancel cover, a very nice Zeppelin card, and a wonderful #M9 (1983 overprint on 1963 military stamp) cover. Greenland Covers: Scott #227 solo use on cover (one of the overprinted Queen stamps) might not seem like a scarce item, but have you ever seen one before? There are also some other very unusual items added. Iceland Stamps: A beautiful mint Scott #6 [4 sk perf 12.5] has just been added. Norway Stamps: I have added a #1 DOUBLE FOOT variety with certificate. Norway Covers: I have just added a remarkably low-priced Norway #1 on cover, as well as a 1906 rare destination post card from the Norwegian Arctic to Uruguay! Plus there are some nice WWII-era censored covers. Sweden Stamps: There are some very nice new and recently added Swedish stamps. Included are a beautiful used St. Bridget stamp (seldom seen in such nice quality), wonderful mint postage dues, and great 1920s Lions. Ryukyu Islands Stamps: I have added a section for the RYUKYU ISLANDS. Many American service members are perhaps all too familiar with the Ryukyus, but these Japanese islands also have beautiful stamps issued under American administration. An emailed-only 25 October 2018 E-News has been issued. If you do not receive the E-News, Subscribe now! Denmark Stamps: A variety of interesting items have been added including used examples of the scarce Scott #55a, 58a & 60a, and Q11. Also a Danish advertising booklet pane that I have not had in used for many years. Finland Stamps: Some interesting new items have been added. Greenland Stamps: A nice Village Cancellation on Pakke-Porto stamp with a plate variety, and quite a few other interesting items have been added. Iceland Stamps: Several nice new items and many other recently-added items. Norway Stamps: I have just added more early Norway stamps in very nice quality, including the rare "short LL" variety on a properly used Scott #17. Sweden Stamps: There are some very nice new and recently added. An emailed-only 16 October 2018 E-News has been issued. If you do not receive the E-News, Subscribe now! Finland Stamps: I have been generally restocking Finland, but also ran into an unusual straight-line railway station cancellation on one of the 1875 issues. Norway Stamps: I have just added a nice range of earlier Norway stamps in very nice quality. For example Scott #68 Mint (one of the last stamps still needed for many collections) and 1890-1910 issues with nice cancellations, etc. I have added many items to various U.S. Possessions, including: Guam Stamps, Hawaii Stamps, and Philippines Stamps (Spanish, U.S. Administration, and Republic). An emailed-only 4 October 2018 E-News has been issued. If you do not receive the E-News, Subscribe now! Aland Postally Used: I have just restocked the Aland stockbooks and was able to add quite a few POSTALLY USED stamps, including some that I had never before been able to offer in postally used. Denmark Advertising Booklet: Some of the most unusual and attractive of the Danish advertising panes/pairs are the KKKK (which refers to the København Coal and Coke Company) issues with their wonderful graphics. I have just added a really nice example of the complete booklet that contains all the panes of this great issue. Faroe #1 on Cover: I have just added a Faroe #1 on a typical cover that, due to quality issues with the envelope, is priced the same as a used single stamp with this great centering. North Ingermanland Covers: As you probably know, if you collect this corner of the Nordic world, covers from North Ingermanland are seldom offered. I have one available now. Norway Early Booklet Stamps: The first few booklets issued by Norway consisted of panes that had straight edges at left and right, and at one end -- just like most early U.S. booklet panes. In the Scandinavian countries -- unlike in the U.S., the straight-edged stamps are considered to be different stamps, with their own designations. The "B" designation after the number indicates a stamp with straight edge on one side, while the "D" designation is for a corner-cut stamp from the end of the pane farthest from the binding margin. I have just added several wonderful USED pairs and a complete USED pane (!!!) of these early and seldom-seen issues. Canal Zone Stamps: I have just added an impressive group of Canal Zone stamps to an already impressive range of listings. The result is, well, impressive! An emailed-only 20 September 2018 E-News has been issued. If you do not receive the E-News, Subscribe now! Denmak Advertising Pairs and Panes: I have just added some attractive items including a couple of advertising panes that are seldom seen in nice used condition. This is a great time to fill in your collection. Iceland Stamp Varieties: I have just added some nice plate and overprint varieties, including three examples of a so-called "double engraving" (technically called a re-entry) that while not listed in the catalogs is very obvious and should be listed. Iceland Covers: I have just added an early Greenlandic hand-colored picture post card mailed in 1912 from Iceland. Either way it is a scarce card. Norway Stamps: A range of early posthorn issues and postage dues have just been added. Both groups include some very unusual colors / varieties in nice quality. United States Stamps: I have just added wonderful examples of the $1 and $5 Liberty plate blocks. Not only are these missing from many collections, but often examples in collections are not well centered. Canada Stamps: I have just added a very nice looking example of Scott #7, an extremely scarce stamp. Mexico Bisect Cover: During the Mexican Revolution there were many disruptions to postal services. Due to stamp supply shortages, bisects were permitted. Of course, philatelists took advantage of the possibilities, but there was also legitimate mail. This cover, addressed in both Spanish and Chinese (!!!) appears to be properly postally used. An emailed-only 11 September 2018 E-News has been issued. If you do not receive the E-News, Subscribe now! Sweden Stamps: I have just added some unusually nice and not often seen 1920-1936 Lion issue stamps. Also a scarce postage due stamp in very nice quality. And be sure to see the recently added high-quality and/or specialized semi-postal stamps. Worldwide Stamps: This week I have added stamps to PRC-China, North Borneo, and Solomon Islands. An emailed-only 6 September 2018 E-News has been issued. If you do not receive the E-News, Subscribe now! United States Official Stamps: The parade of Official Stamps completes this week with another 117 new items. This group concludes the offering. I strongly suggest taking a serious look at them; there are many stamps here that you may not see (in such attractive quality) for a long time. An emailed-only 30 August 2018 E-News has been issued. If you do not receive the E-News, Subscribe now! United States Official Stamps: I have now started listing a 1920s collection hoard from the beginning. This first group contains 60 items from #O1 through #O36, missing only four catalog numbers. There is a mix of mint and used stamps for your consideration. An emailed-only 23 August 2018 E-News has been issued. If you do not receive the E-News, Subscribe now! Danish West Indies Covers: I have just added a very interesting early pre-stamp cover and also a very unusual printed matter rate postal stationery envelope used to Norway. Denmark Covers: I have just added a remarkable type of item: A postal stationery wrapper cut-out, overprinted for a stamp show, and used on cover. The overprinting was soon-after banned, but such cut-outs continued to be "legal" for postage. Iceland Covers: I have just added an unusual WWII censored cover with one of the Geyser stamps that is quite hard to find on cover. Norway Early Stampless Cover: In the early period after stamps were issued, one could still send covers without stamps. However, the majority of the post-1854 stampless mail was Official Mail. Such covers are remarkably inexpensive even though they are up to 160 years old and sometimes have unusual postmarks. Norway SPITZBERGEN Local Post Card: I have just added a very attractive 1903 picture post card (artist-signed, scene of Spitzbergen) with a 5 øre Spitzbergen local. Slania-Engraved: I have just added a new U.S. Souvenir Page variety that is the first example I had ever seen even though it was issued 26 years ago. I have restocked others and now have in stock all Slania issues for which there were U.S. Souvenir Pages. United States Astronaut-Signed Cover: I have just added a James Lovell autographed Apollo 13 launch-date cover. In case you don't recall, the Apollo 13 mission ran into serious trouble and lost virtually all of the on-board oxygen in addition to losing the ability to generate oxygen. The mission had to be aborted, sling-shotting around the Moon to successfully make it back to Earth before running completely out of oxygen. Worldwide Stamps: This week I have added stamps to Gibraltar and Liechtenstein. An emailed-only 16 August 2018 E-News has been issued. If you do not receive the E-News, Subscribe now! Denmark Advertising Pairs: I have just added several Advertising Pairs. These pairs, on which the post office sold advertising, are very interesting and a "rarity" in philately. Denmark Airmail Cover: This 1932 cover, actually a card, has it all: One of the stamps is an AFA-listed plate variety, it was used for airmail from a stamp show with a very unusual (for Denmark) type of postmark, and the card is quite unusual itself. Faroe Stamps: This week I added more of the 1940s WWII-era overprints, including very attractive examples of #5 and #6, as well as others. Finland Cover: I guess I am fascinated by uses of Scott #B1, the first semi-postal stamp. I have just added one that I would never had expected to see: A 1923 second weight class Express cover bearing both a single and a block. Greenland Stamps: I have just added a wonderful NH Scott #Q7a, a stamp missing from most Mint/NH collections. Iceland Stamps: I have just added a wonderful example of Scott #13a (first printing of the 20 aur Violet) in genuinely used condition. Iceland Covers: For some reason I am fascinated with Icelandic Express Mail coves; probably just because there are not many to be had. I have just added another nice example. Norway Stamps: I have just added nice mint examples of the two paper/gum types of the 7 skilling Posthorn stamps AND unusual NH and Used (!!) blocks of one of the early Posthorn issues. Sweden Stamps: I have just added a very attractive, but very reasonably priced example of NUMBER ONE. It has incredible color! I have also added a lot of three 1920s 30 öre Lion stamps include a FULL CYLINDER NUMBER and a LARGE POSITION DOT. U.S. Stamps: This week I have added a varied group of items including unusual blocks and plate blocks, another U.S. NUMBER ONE, and a very scarce "plate block" of the Sylvester & Tweety Bird souvenir sheet (which can only come from a press sheet). U.S. Covers: From an estate I offer a group of very interesting covers and items related to a U.S. Marine ca.1959. There is also a PREXIE $5.00 COOLIDGE ON A PARCEL POST TAG -- this is an extremely scarce item, quite different from the more "commonly" seen "bank tag". An emailed-only 2 August 2018 E-News has been issued. If you do not receive the E-News, Subscribe now! Norway Early Rare First Day Covers: I am breaking down a remarkable collection of early, rare FDCs and the scarce definitive issue FDCs. Today I start with a dozen items, with a sampling of a) the earliest items; b) the tail end of the early 1960s definitives that are scarce; and c) early semi-postals and airmails, including the first airmail stamp. U.S. Stamps: This week I have added an eye-opening range of mint blocks, ranging from Columbians in blocks to 1920s and early 1930s in blocks and plate blocks. There are some very nice (and unusual) items here. An emailed-only 26 July 2018 E-News has been issued. If you do not receive the E-News, Subscribe now! Faroe Stamps: I have just added a nice range of Faroe items, including the 1919 Scott #1 (mint) and the Faroe Bisect and ranging through the WWII-era British-Occupation Overprints (mint, used, covers, etc.) There are quite a few very nice items. U.S. Stamps: This week I have added 60+ 1920-1930s stamps with very nice examples of early commemoratives, wonderful-quality definitives, early mint airmails, Kansas and Nebraska overprints, and more. Stamp Mounts: I have just added some BLACK Showgard-type mounts to the website. An emailed-only 19 July 2018 E-News has been issued. If you do not receive the E-News, Subscribe now! U.S. Stamps: This week I have added many examples of U.S. #1 and #2, and also other classics ranging from a #9X1 to 1869 issues, to Columbians with dollar values. Also this week are several new mint U.S. ZEPPELIN stamps. An emailed-only 12 July 2018 E-News has been issued. If you do not receive the E-News, Subscribe now! Norway Stamps: I have added a few new items including a very nice Scott #28 with unusually strong color. Sweden Stamps: I have just added more nice singles stamps, including a very scarce KPV watermark and a "beehive" postmark. U.S. Stamps: I have just added a big group of 1869-1880s stamps, in both mint and used. Also some very attractive Zeppelin stamps. Confederate States Stamps: I have added a nice range. An emailed-only 5 July 2018 E-News has been issued. If you do not receive the E-News, Subscribe now! Denmark Plate Varieties: Some interesting items have just been added to the website. Iceland Stamps: I have added a few new items this week and there are still some great items added last from the 1930 Parliament (Althing) set, Scott #152-166. U.S. Duck Stamps (2 pages): I have just added about 80 new items in the Federal Duck Stamp section, from #RW1 all the way through the later self-adhesive souvenir sheets, and even some artist-signed souvenir sheets. An emailed-only 28 June 2018 E-News has been issued. If you do not receive the E-News, Subscribe now! D.W.I. Stamps and D.W.I. Covers: I have just added some very attractive stamps and also a couple very unusual DWI-transit covers, including one to Mexico that they managed to eventually deliver even without the town name! Iceland Stamps: There are about 75 (!!) new items from the 1930 Parliament (Althing) set, Scott #152-166. These range from almost ALL stamps of the set as various NH, Mint Hinged, and Used examples in TOP QUALITY, as well as some Bargains examples of the scarcer stamps. Sweden Stamps: I have just added a few nice singles, blocks, plate varieties, etc. U.S. Stamps: I have just added ANOTHER very fresh & attractive range of Washington-Franklin stamps, this time from 1917 to the end of the W-F era. Following those are many new really nice examples of 1922-1931 Fourth Bureau issues, including Kansas and Nebraska overprints. There are both NH and Mint Hinged stamps. Again, the common thread that connects these is the freshness and brilliant colors. An emailed-only 21 June 2018 E-News has been issued. If you do not receive the E-News, Subscribe now! U.S. Stamps: I have just added a very fresh & attractive range of Washington-Franklin stamps, both NH and Mint Hinged. The common thread that connects these is the freshness and brilliant colors. An emailed-only 14 June 2018 E-News has been issued. If you do not receive the E-News, Subscribe now! D.W.I. Political Protest Labels: When the sale by Denmark of the DWI (Virgin Islands) to the U.S. was being considered, a few political labels were issued, mostly to protest the sale. I have just added to the website multiple examples of the scarcer protest label. 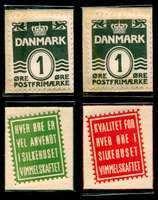 Denmark Stamps: A great POSTFÆRGE overprint 4-block has just been added to the website. Finland Stamps: An attractive, but inexpensive mint example of one of the early "Serpentines" has just been added. Greenland Postal Savings Stamps: Virtually all Greenland collectors know about the Pakke-Porto (parcel post) "Bears", but few know that they were sometimes used as savings stamps in the national savings system operated by the post office (which was an arm of the KGH, the Royal Greenland Trading Company). Such stamps were often canceled with the special "Avane" (and number) postmark. What is even less known is that special purpose postal savings stamps were also issued. They are the same general size and format of the Pakke-Porto stamps. Two values are known, and one of them in two shades (which I seem to have been the first to report into the literature). These were canceled with the same types of postmarks that were used on the Pakke-Porto stamps. I have just added used examples of both values. Greenland Semi-Official Dafila and Faborg Booklets: As the result of a recent purchase, I have "discovered" (I am not aware of any other listings in the literature) TWO MORE MOUNTING VARIETIES and have been able to add to stock two other scarce varieties that had been out of stock for a long time. Iceland Christmas Seals (10 pages): I have just restocked most of the earliest National (Thorvaldsen Society / TB) seals, with most in stock in NH condition (scarce on these). If you collect Iceland and have not seen their beautiful Christmas seals, they are certainly worth a look. U.S. Covers: New this week are two interesting covers: A #1 that has been added to a stampless cover (but is priced very, very low even just for the plain stamp) and a Presidential MOURNING cover with contents. Worldwide Stamps: This week I have added stamps to Algeria and Ireland (5 pages). An emailed-only 7 June 2018 E-News has been issued. If you do not receive the E-News, Subscribe now! DWI Stamps: I have been restocking various DWI stamp issues. Finland Stamps: I have also been working on restocking various eras of Finnish stamps, though I do have much more yet to do. Iceland Stamps: I have been restocking in early issues, middle period, and back-of-book, including both mint and used stamps. U.S. Stamps: This week I continued adding new items, focusing on 1923-1938. Starting with the very scarcer "coil waste" stamps and through the Perf 10 issues, all the way to the Prexies. An emailed-only 24 May 2018 E-News has been issued. If you do not receive the E-News, Subscribe now! Book: Postal Rates in Iceland 1870-2009, Second (2017) Edition The primary reference for Icelandic postal rates. Significantly UPDATED. Entirely in English and with 229 pages and color illustrations. A monumental work including the local, domestic, Nordic, European, and world rates; parcel rates, special services, etc. Due to newly obtained information still in preparation, the worldwide parcel rates only extend up to WWII (thus for now, keep your old edition for the later world parcel rates). The rate tables are easy to understand and use; the air tables include both the supplemental air rate information and the total of the air and the surface components. U.S. Stamps: I have just added a nice range of Mint U.S. Stamps in the Scott #551-573 range. There are both NH and Hinged stamps offered, with a range of centering. An emailed-only 10 May 2018 E-News has been issued. If you do not receive the E-News, Subscribe now! Faroe Machine Stamps: I am finally able to offer a new denomination type and underlying stamp printing for Faroe's first issue of machine stamps. I have also updated and expanded my listings of the stamps and the FDCs of the stamps. Greenland Inverted Overprints: I have just added three values of the 1945 overprinted set with inverted overprints, two NH and one lightly hinged. All have certificates of course. I have also just added the 1996 Queen with inverted overprint, with a certificate and a signed statement from the discoverer. Greenland Semi-Official Booklets: In addition to all the individual booklets, plus some varieties, I can offer the complete set of 16 booklets at a great price! Iceland Stamps: I have restocked Scott #152-166, the 1930 Parliament set (in NH, Mint Hinged, and Used), including a nice range of the scarce high denomination stamps, #162-166. Norway Stamps: I have just added a very attractive Scott #41, the 12 øre green Unshaded Posthorn. This stamp is often seen damaged or repaired because of the type of mail it was used on. However this example is not only extremely well centered, it is completely without any defects and in excellent quality. U.S. Stamps: I have just added a nice range of Mint U.S. Stamps in the Scott #231-336 range. An emailed-only 3 May 2018 E-News has been issued. If you do not receive the E-News, Subscribe now! New printed price lists of all -- and only -- the items on the website are available. The printed price lists do not include the illustrations. Due to the amount of work involved, the printed price lists are updated only every few weeks. Worldwide Stamps (and a few covers). Does not include U.S. or Scandinavia. Please only request the lists you actually need; they are very expensive to print and mail. Please note that these lists only include what you see listed on this website and are provided simply as a convenience. If what you are seeking is not shown on the website, then please send your want list rather than just requesting a price list. (If it is not on the website, it won't be in the price list.) Clients who send want lists always have access to the freshest stock and new items as they come in. The first copy of printed price lists will be sent to U.S. and Canadian clients at no charge. Further updates can be sent, upon request, at no charge to those clients actively making purchases or who send want lists. Otherwise there may be a postage charge for further updates -- these lists cost several dollars each to print and mail. Unfortunately, due to the large number of requests received from overseas people who seem to just collect "free price lists" -- and because a) all the information the lists contain is on this website and b) the overseas airmail postage cost is very high -- there will be a MINIMUM $10 shipping charge (payable by MasterCard, Visa, PayPal, cash, US$ check, etc.) for price lists sent to overseas addresses. A matching-amount credit voucher will be included with the price lists and will be valid only on purchases (totaling) at least five times the amount of the credit. Example: If the shipping cost is $10, you will receive a $10 credit which will be valid on a purchase of $50 or more. Please email to inform me of the desired price lists and to learn the shipping cost for them. I will need to know exactly which price lists you wish to receive and I will need to know your COMPLETE POSTAL ADDRESS. To send shipping cost payment by PayPal, use the email address "paypal@JaySmith.com", use a subject of "Price List Shipping Payment" and be sure to indicate again the price lists you desire and include your complete postal address. To send your MasterCard or Visa number, please use my secure payment website. For your security, never put a credit card number in a normal email! To send a US$ check or cash (at your own risk), please see my postal address information. Fluorescence, Phosphorescence, Ultraviolet Light, and Scandinavian Philately A useful and practical explanation. Hidden in Plain View: Stamp Position Codes "The language of stamps" or the meaning of stamp positions on letters and post cards. An interesting new, fully illustrated article on Swedish stamp formats and the different perforations that result. Several other interesting articles are available with new articles posted regularly. Regular (2-4 times per month) email newsletter with Scandinavian philatelic news, announcements of new books and catalogs, and special sale offers (Scandinavian and world-wide collections, Scandinavian used albums, and pre-owned philatelic literature) at great prices. Many special offers are only made through the E-News. This is a great way to stay current and get some great deals. You can also view the archive (still being finished) of previous editions of the E-News. To meet my own need for catalog number concordances, I have finally started publishing comprehensive catalog number concordances for the Scandinavian countries. At this moment only DWI, Greenland, and Iceland are ready (the later two only up to 1995, so far). However, I will be preparing these bidirectional catalog number concordances for all the Scandinavian countries and eventually will include the other specialized catalogs as well. Reservations are welcomed. These are very inexpensive (considering the labor required to make them) and are published loose-leaf. An attractive binder is available. I intend to update the concordances annually; subscriptions are available. Though these have only been available for a few weeks, they have been a great hit. You will find them extremely useful! Facit Specialized Catalog PAGES BY THE COUNTRY. These are genuine Facit Catalog pages, not copies (of course!). They are loose pages; please be aware that there is no room for binding -- you will have to figure out for yourself how to bind or otherwise manage them. The pricing is by country. There are sometimes conflicts involving back-to-back countries, thus I am offering the pages a number of different ways to compensate for this. Supply is very limited. If you have always wanted a Facit Catalog, but could not justify it for "just one country", this is your chance -- but you must act quickly. Here is more information about the Facit Scandinavian Specialized Catalog. My shopping cart system is fully functional for almost all the price list pages. The cart system will be extended to the few remaining pages very soon. I also have a secure website for secure acceptance of credit card payments. You can use this method any time you wish to send your credit card information: for placing orders, making approval payments, or for updating new issue and Stender supplement credit card information, etc. I take the privacy and security of your information very seriously -- I never share your information with anybody for any reason. The web versions of my philatelic literature price lists were last updated on 22 April 2019 and are the most current. Knowledge is the key to enjoying your collection and the key to buying wisely. View the listings live on the web or download the literature price list in PDF format. Let me know If you would prefer a printed copy sent by postal mail. Jay Smith & Associates is offering to its clients an opportunity to invest in the company. If you might be interested in interest rates of up to 8% (paid in cash) and up to 15% (paid in merchandise credit), be sure to read the complete information and risk statement. We do not currently have any shows schedule, but will likely participate in one or two North Carolina shows in 2018. Watch this space for updates. with special offers and announcement of new items. Click here to send an email to subscribe now! Please include your full name and also postal address. Thanks! Save up to 33% on mailing! Pre-made units for 1 & 2 ounce letters and post cards.